Spongepot is the ideal germination medium for your cannabis seeds. The Spongepots consists of different types of peat and cocos with a organic glue which makes it feel 'spongy'. The use of spongepots is extremely easy, avoiding the usual mistake of using wet tissues, wrong soils etcetera. The optimal moisture climate is controlled by the spongepot. One tray consists of 20 spongepots to germinate 20 seeds! To start with you need one litre water with a temperature of around 25 degrees. You can add the products you always use. For watering in the Spongepots we use Bacto, following the instructions on the label. You can find detailed information about the benefits of using Bacto for all stages of growth and bloom in Sannie's shop. 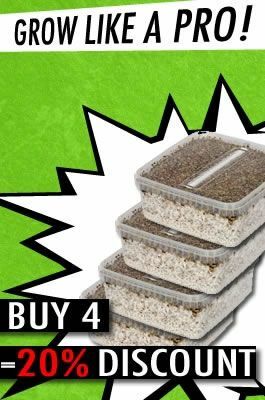 Place the Spongepots on a layer of perlite in a propagator. Irrigate the Spongepots and the perlite with the mixture you made. Make sure the layer of Perlite contains a small reservoir of water which is not near the surface of the Perlite. Otherwise the Spongepots may absorb too much water which is not beneficial for the seedling. Using Bacto will provide an optimal balance between water and air in the Spongepot. By keeping the layer of Perlite sufficiently moist, the Spongepot will be moist as well, due to absorbing fluids from the Perlite. It also keeps the humidity high in the propagator. Check the Spongepots now and again to see if the fluid level in the Perlite is high enough. There must be a hole pierced in every Spongepot, which is approximately 20 to 30 mm deep. A handy tool can be created by marking the correct distance on a screwdriver with a tie-wrap or piece of tape. Now pierce the Spongepot until the marker touches the surface of the Spongepot, and every hole will be of the correct depth. When the clones are cut you can dip on some clone gel or powder and put them in the spongepots, beware you dont wipe of al the gel or powder when putting in the clone. Put in the clone gently and use only little force to anker the bottom in the spongepot. When al the cuttings are placed in the spongepots its time to put them in a propagator so they can stay in a moisture enviroment. The perlite will keep the humidity high and your cuttings will have roots in no time. Put the cuttings in the soil when there are several roots to see and because they rooted on soil they will grow imediately in there new bucket without needing adjustment time! Spongepots (20 pots) does not have any reviews yet. Share your experiences and post a review.